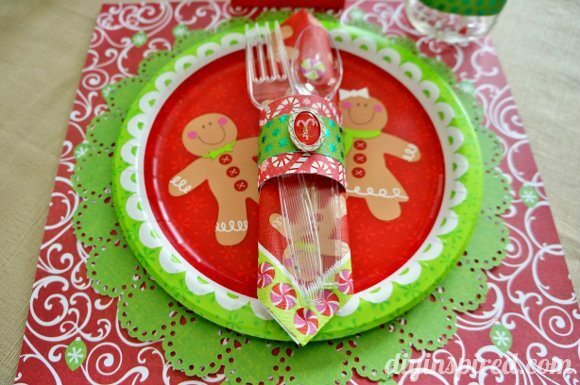 This post, Kids Christmas Table Setting, is sponsored by Jo-Ann Fabrics and Crafts and DCWV for the PaperCrafted Christmas Campaign. All opinions are 100% my own. Every year, my four best friends and I get together for a Christmas party. We have great memories each year of the kids making ornaments and decorating cookies. This year, I wanted to make a special table for the kids. With the help of Die Cuts With a View (DCWV), I was able to make a colorful and whimsical Kids Christmas Table Setting out of mostly paper! 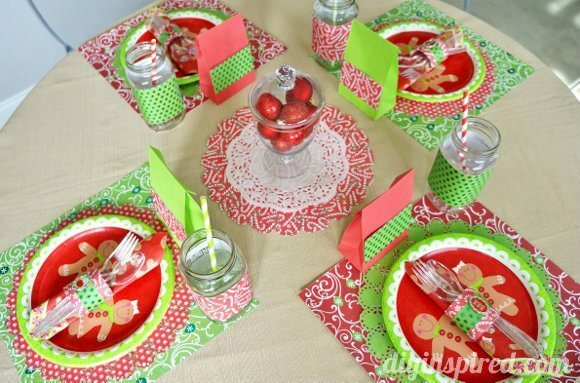 Using sturdy decorative cardstock is perfect for a kids table setting because it’s thick enough to avoid rips, unbreakable, and easily disposable. 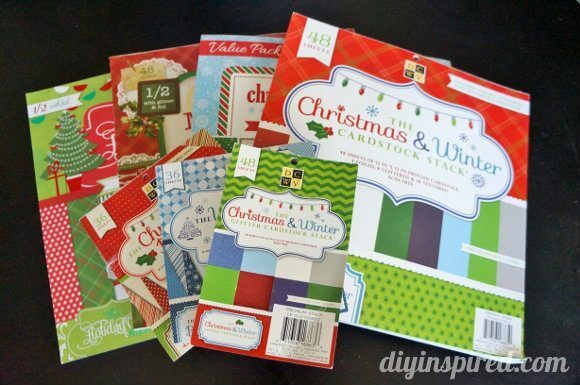 DCWV has so many fun and festive winter and holiday supplies. 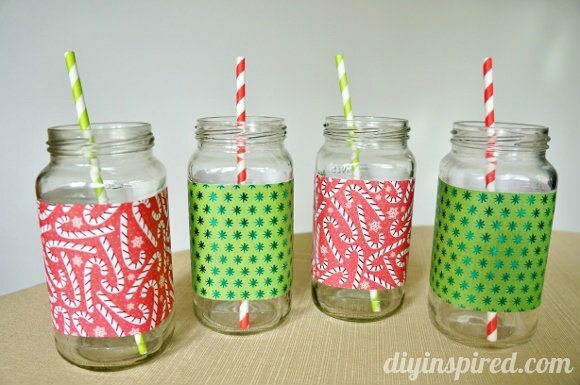 I started off by simply covering recycled Mason jars with coordinating paper. For the napkin rings I picked two different colors and patterns and topped it off with a charm from the DCWV Christmas & Winter embellishment pack. 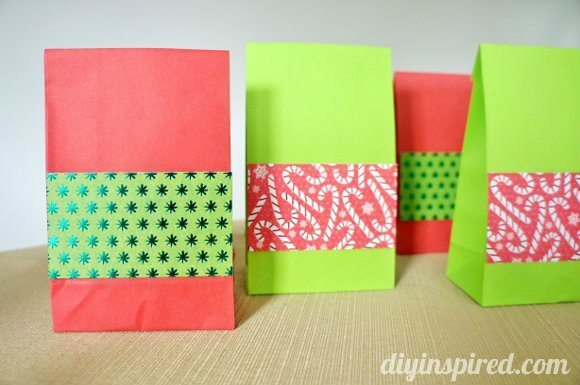 I also covered some red and green favor bags filled with candy for each guest. For the placemats, I layered one 12X12 sheet of DCWV underneath a paper doily I made using a circle edge punch at 11” in diameter. Here is a tutorial for how to make a paper doily. I also made a paper doily for the center of the table. 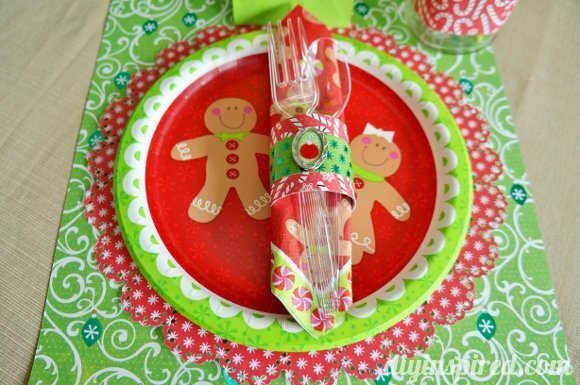 I purchased the adorable gingerbread boy and girl plates and napkins from Jo-Ann Fabric and Craft stores. There you have it! I hope you enjoyed my version of a Paper Crafted Christmas! Here is a 50% coupon good until December 31st, 2013 for your next purchase at Jo-Ann’s! Enjoy! Super cute. We have a separate kids area for our annual Christmas party. I may use some of these ideas to decorate for it! I love all these ideas. I have some mason jars just begging to be wrapped . What a fun way to make Christmas even more fun for kids! 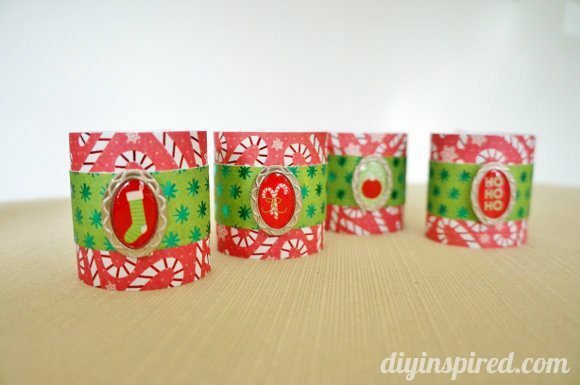 This is so cool.. love the napkin rings.. so cute.. Thank you so much! Easy peasy! That’s about as cute as it gets – love this idea! This is the most adorable table! I love love love the gingerbread people, and the doilies made a nice touch.